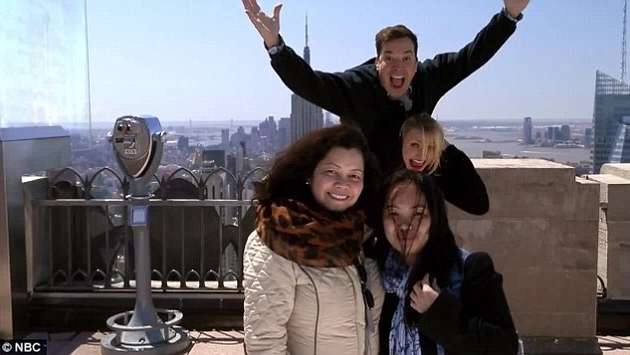 Jimmy Fallon and Cameron Diaz pranked unsuspecting tourists at the top of Rockefeller Center in New York City, popping up in the background of photos. We must admit -- these are some of the best photobombs we've ever seen! These two skilled experts performed piggyback rides, wore Pharrell Williams' famous hat, and whipped out a foot-long hoagie. Thankfully, there's a video of Jimmy and Cameron's Big Apple shenanigans, which aired on Wednesday night's "Tonight Show." Jimmy and Jon Hamm pulled the same prank in March, and the results were just as hilarious. Watch the clips below to get some inspiration for your next photobombing attempt.